Today there is good news for thousands of Dutch heart patients. After the largest insurer Zilveren Kruis announced to fully reimburse the e-health service HeartGuard, four other major healthcare insurers (VGZ, DSW, ONVZ, De Friesland) will also follow and reimburse HeartGuard in 2017. Cardiology Centers The Netherlands (CCN), together with FocusCura founding partner of HeartGuard, accounced this news today. HeartGuard enables to continuous monitoring of cardiovascular patients, suffering from heart failure, hypertension or atrial fibrillation. Patients can measure their vital signs at home with the cVitals App, developed by the Dutch healthcare innovation company FocusCura. 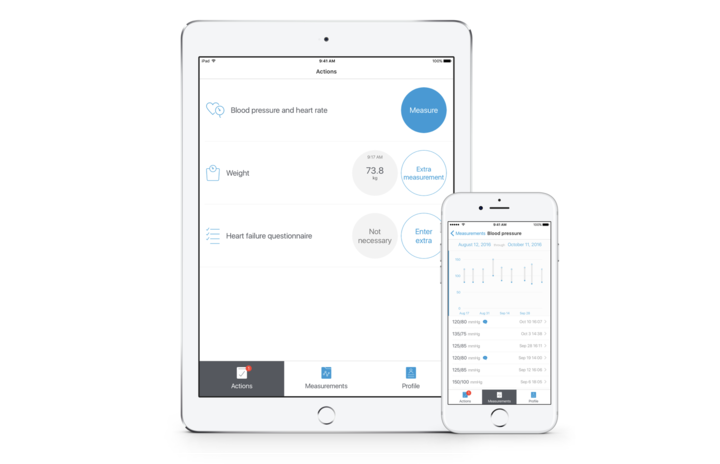 The vital signs, like blood pressure or weight, are sent in remotely through the cVitals App on the iPhone or iPad of the patient to the cardiology centers and are automatically added to the Electronic Medical Record of the patient. Doctors and nurses will be alarmed in case of detection of an increased health risk. Following that alarm, the staff will reach out to the patient and/or general practitioner. Hospital admissions and outpatient clinic visits are reduced by the HeartGuard service. By reimbursing HeartGuard, Dutch insurers are setting an example. They are showing that they are not only retaining traditional care delivery, but are willing to support innovation. ''HeartGuard is at the forefront of further evolution in healthcare and by opening up the service to these new patients, we can increase our insights on the effects of this innovative healthcare service on an even larger scale'', says Cecile Goldman. Chairman of the Board of insurer ONVZ Jean-Paul van Haarlem is enthusiastic about the possibilities of HeartGuard for its clients: ''This is an innovation that provides patients with personalized care. HeartGuard will have a positive impact on quality of care and on efficient use of resources. Because it monitors the patient's health remotely, HeartGuard will lead to a reduced number of hospital visits. This is a major improvement for the patient. Reimbursing HeartGuard is an important step for heart patients insured at ONVZ. ''We are very happy with the fact that we have realized this breakthrough last summer with FocusCura and CCN to bring chronic cardiovascular care close to our clients. The fact that others follow this example towards innovative care making it available to more patients is great,'' says Erik-Jan Wilhelm, VP of Strategy and Innovation of Zilveren Kruis. This press release was published by our partner Cardiology Centers The Netherlands on 6 march 2017. More Information? HeartGuard uses the FocusCura Apps cVitals and cContact.